If you took a little bit of Twitter and added in a big scoop of enthusiasm for running, you'd end up with something a whole lot like dailymile. This is a workout planning and tracking service that's heavy on social networking features. Dailymile's cool graphing features let you see, at a glance, how many miles you've covered. Dailymile is free to use: You can sign up for an account with your email address, or by linking your Facebook or Twitter account. Once you're logged in, you can begin creating and tracking workouts, and exploring dailymile's social features. You can track a variety of activities, including running, cycling, swimming, walking, and more, and can add your distance and time, and can rate how you felt. If you're not sure of the distance, you can use the embedded map to track your route, which is a nice touch Rival services, such as MapMyRUN and FriendFit, require you to create the workout first, before logging it. Having the map integrated is a nice touch. So, too, is the fact that dailymile's maps follow the curves and bends of the mapped roads as you create your route. FriendFit also offers this feature, while other services, such as MapMyRun and WalkJogRun, don't offer it by default, instead requiring that you manually adjust your route to follow the road. Once you've logged your workout, dailymile displays your progress in a variety of useful ways. A bar chart, organized by date, lets you see the miles you've logged at a glance; clicking the training tab takes things a step further, displaying your average distance, pace, time, intensity, and more. And your lifetime stats serves up your total miles and time, as well as pounds burned, gas saved, TVs powered, and donuts burned off. The presentation and the information offered up are both entertaining and useful. Dailymile's appeal is only partly about its fitness features: It's just as much a social networking site. The home page offers a Facebook-like status update bar that lets you share information about your training with other dailymile users; updates also can be posted to Facebook and Twitter. Anything you share on dailymile is offered up to the entire site's audience, though, as there are no privacy controls for limiting who sees the info you post. Likewise, you're free to view and comment on the updates that any other users post. Dailymile's home page displays a Twitter-like feed of updates; you can see those posted only by you and your friends (contacts you import who also are using Dailymile), dailymile users close by, or the entire dailymile community. And, just like Twitter, dailymile alerts you when there are new posts to view. The dailymile updates are mildly entertaining, but I didn't find them terribly relevant to my training. More useful was dailymile's "Challenges" feature, which lets community members create and participate in challenges. I just joined a group challenge to run 75 miles in May, and plan on using dailymile to track my progress toward that goal. Dailymile will appeal to those looking for a way to track their workouts and draw motivation from its social features. While it offers some fun--and useful -graphing features, dailymile is for true extroverts only. If you'd like to keep some of your workout info away from prying eyes, you may be better off with a site like FriendFit. It offers some similar social features, but manages to guard your privacy at the same time. 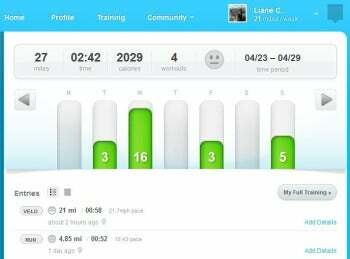 Dailymile brings Twitter-like social networking features to the world of workout tracking.